In New Mexico, a U.S.-Japanese consortium is trying out a new way to match the unpredictability of solar power to a smoothly functioning grid: bringing customer energy prices into the mix. The setting is Los Alamos County, where Toshiba has hooked up a 1-megawatt solar array and a combined 1.8 megawatts of sodium-sulfur and advanced lead-acid batteries via its Micro Energy Management System (MicroEMS) platform -- a software system designed to manage distribution grids with multiple distributed resources. That section of grid serves about 800 homes that have been equipped with smart meters from Toshiba subsidiary Landis+Gyr over the past year or so, Dan Hokanson, Landis+Gyr’s director of meter data management solutions, said. That allows the partners to match individual home power usage and trends against the ebb and flow of solar and battery-supplied power, as well as power supplied from the grid at large. Last month, the partners launched the newest phase of the project, a demand response program designed by Japan’s Kyoto University. This combines a control group of homeowners who pay standard rates for power, as well as a combination of customers signed up for critical peak pricing (CPP) programs and peak-time rebate programs, with a variety of methods -- emails, text messages, web portals, and in-home energy displays -- to get those pricing messages across. Over the course of the next six months or so, the study should yield valuable insight into just what combinations of pricing programs, in-home technology and messaging methods can get homeowners to manage their power in a way that optimizes that solar-grid mix, Hokanson said. 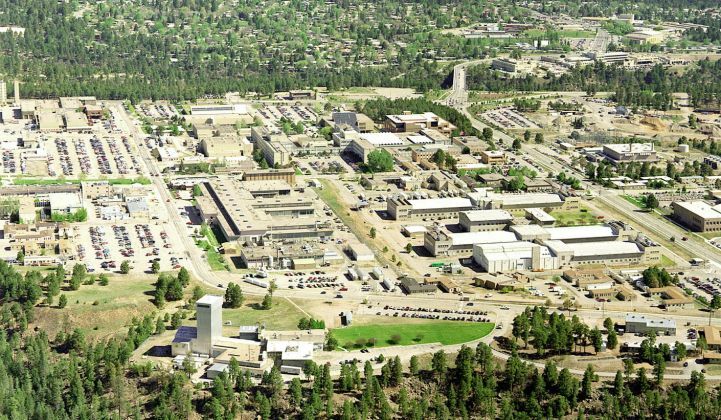 The Los Alamos project is one of two being carried out in New Mexico by a consortium of the U.S. Department of Energy, which runs Los Alamos National Laboratory, and Japan's New Energy and Industrial Technology Development Organization (NEDO), meant to test a wide variety of smart grid and renewable energy systems. Combinations like these are often referred to either as "microgrids," if they’re built to run in isolation from the grid at large, or as "virtual power plants," if they’re meant to remain grid-connected. Toshiba’s MicroEMS plays an important role in monitoring the system, he said: “It’s determining the weather patterns, and solar array output, and from there, it’s forecasting days ahead.” That allows the utility to predict just when it’s wisest to use backup battery power, versus grid-supplied power, to meet its daily needs, as well as indicating how much battery power to store up for what’s predicted to happen tomorrow. At the same time, “during peak situations, utilities pay a premium for that power,” he said. “MicroEMS can determine what those prices are, and ask whether it is cheaper to buy it on the open market or to turn up other resources” such as batteries, or having lots of houses reduce their power consumption. Combining moment-to-moment distribution grid control and energy storage management with day-ahead forecasting of weather, power prices and solar battery-plus-demand response resource capacity is a challenge, he said -- but at least it’s a set of challenges within the utility’s purview. Adding demand response, on the other hand, brings in a whole new set of variables into the equation -- specifically, the unpredictability of how people will react to those various price signals, and what those responses will do to the system’s overall stability. Getting a handle on this human variability is the key to the project’s next phase, Hokanson said. Certainly there are tools to get people to respond in ways that utilities can rely on, he said. One key concept is to reward people for their participation with quickly delivered and noticeable messages, he said. With the Los Alamos project, for instance, “There’s a daily feedback loop. After each event, the MDMS [meter data management system] is sending feedback to the MicroEMS system, and the MicroEMS is calculating the rebate and sending emails to the participants, saying, ‘Hey, you participated in this event, and here’s the rebate you earned.'" On the other hand, CPP programs that impose very high prices during a few critical peak events per year, in exchange for slightly lower rates the rest of the time can serve a similar purpose at less cost to the utility -- though they’re certainly less popular with customers than rebate programs that send them money. And then again, sometimes people will respond to requests to shave power use without expecting a reward, Hokason noted. Finding the sweet spot between not paying customers enough to take part, and paying them too much and making the program uneconomical, is important for utilities that want to make sure their demand response programs capture the biggest bang for the buck, he said. We’ve seen lots of projects tackling the data analysis and behavioral management challenges implicit in getting individual power consumers to behave predictably via fine-tuned demand response. Adding more and more intermittent power resources like wind and solar to the grid is bound to make the grid-balancing task even more complex. Designing and incentivizing rate programs that can turn unpredictable customers into reliable grid-balancing agents could be a big step forward in solving challenges like these. Stay tuned for results from this project, and others like it, for progress on that front.